The Shoal Shawl is a triangular shawl knit on the bias in a typical boomerang fashion which results in a wearable and elegant accessory. Did we mention it is fully reversible? 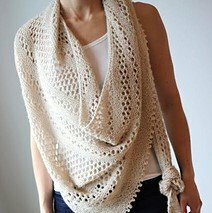 In this class you'll learn to increase on the bias for an asymmetrical shape while working a simple mesh lace that will help keep you interested from cast on to bind off.